He also alleged that the experience gave him the ability to levitate and see through walls. Every American schoolchild knows that Americans fought the Nazis and played a significant role in helping to free Europe. The entire United States rallied around their flag and pitched into the war effort as they were able, and helped win the war. Even on the homefront people planted victory gardens and women entered factory work. Red-blooded Americans everywhere took a stand against the Nazis and helped save the world from their oppression. Unfortunately, this is an overly simplistic and optimistic view as tens of thousands of Americans (at least) were Nazis. In fact, the number of Nazi sympathizers in the United States, especially pre-war, may have been much higher. Today, the American role in World War 2 is seen as one of the countries proudest moments. How could so many Americans have been on the opposite side? The Bund’s Nazi stormtroopers beat protestors in the streets. Just as in Germany, the Nazis used violence to deny their opponents the Constitutional rights to freedom of assembly and speech. How could America get to such a point – and only six months before Hitler invaded Poland? It was not as hard for the Nazis as one might think. Racism and anti-Semitism was hardly new in the United States, and the Nazis played off traditionalism in regards to such bigoted ideas. The Nazis also portrayed themselves not as aggressors but as non-interventionists who simply felt that America had no role in a European war. At the same time, the Nazi organizations were sending money to Nazis and encouraging the American government to be friendly towards Germany. However, among American Nazis, there were some who were even more radical: the Silver Legion. 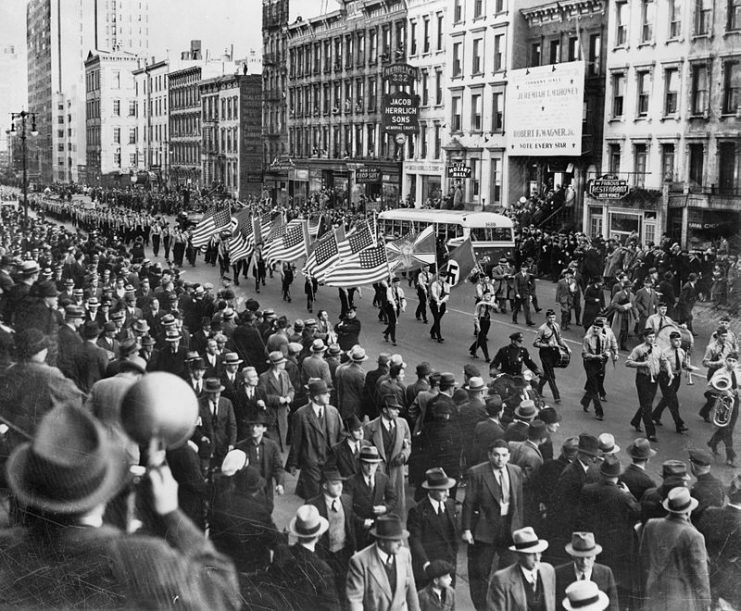 German American Bund parade on East 86th St., New York City, October 30, 1939. The Silver Legion was a pro-Nazi paramilitary organization founded by William Dudley Pelley. Their ideology was predictable: anti-semitic, anti-immigrant, racist, sexist, white nationalist, and traditionalist. They also declared themselves to be specifically a Christian organization and only accepted white, male, Christian members. They took their inspiration from Hitler’s Brownshirts and conducted violent acts accordingly. William Dudley Pelley, extremist and spiritualist. By 1934, they had around 15,000 members. How did they get so many people to join a Nazi paramilitary organization? One of their primary recruitment methods was to play on longstanding racial conflicts and resentment in the United States. Much like the Ku Klux Klan, which had decreased in power at this time (only to reemerge in the 50s and 60s), they promised whites that blacks would be disenfranchised. They assured whites in diverse states a continued monopoly on power. Their explicitly Christian and traditionalist identity also played well in many areas, especially in the South, where they were at their most powerful. Finally, they followed Hitler in demonizing and scapegoating Jews for the Great Depression and the slow recovery. The Roman L was the Silver Legion’s official symbol. However, the group was not limited by region and actually set up a secret headquarters in Los Angeles. A Nazi agent befriended Jessie Murphy, a wealthy mining heiress, and convinced her to contribute funds and a ranch to their cause. 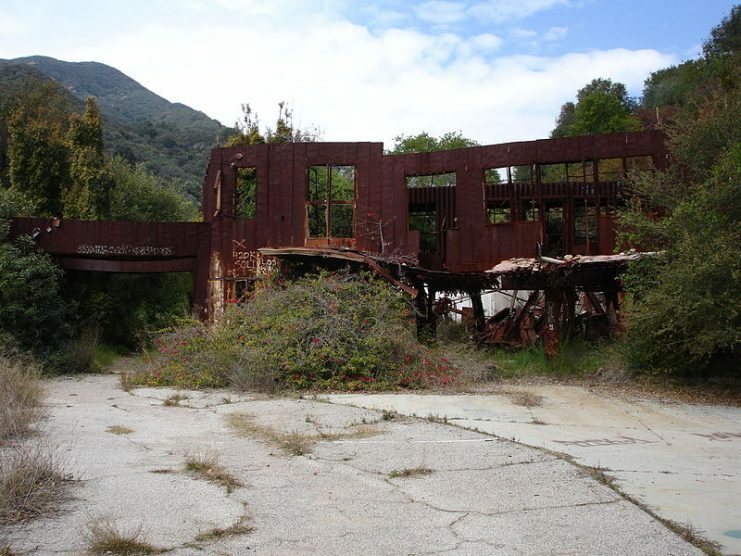 The Murphy Ranch, as it came to be known, is what set the Legion apart from many similar organizations. The Legion began to fortify and guard the ranch in anticipation of using it as a headquarters after they took over the United States. 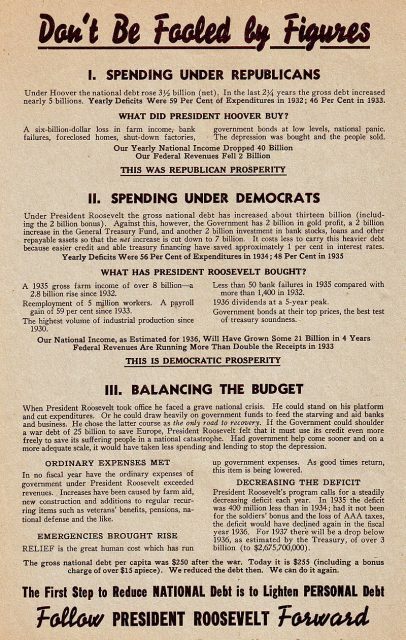 William Pelley decided that things were falling into place for a “Silver Revolution” and ran for President in 1936. He founded the Christian Party and launched a campaign called The Silver Cavalcade. He said he would declare himself “The Chief” (an analog to Fuhrer and Il Duce) and form a white nationalist theocracy. The rallies were frequently marked by violence. It seems Pelley genuinely felt he could win the election, or at least gather significant support. Ultimately, Pelley’s campaign did not go how he envisioned, and he only got on the ballot in Washington State. The Left-Wing Franklin Roosevelt was reelected by one of the largest margins in American history, while Pelley got around 1,600 votes. This poor result greatly weakened the Legion, and many members quit. By 1938, they only had about 5,000 remaining members. It is worth mentioning that despite calling his party “Christian,” Pelley’s views were extremely unorthodox. He described meeting God and Jesus while having an out-of-body experience and traveling through multiple dimensions. He declared that, during this experience, God ordered him to remake America in the Silver Legion’s vision. He also alleged that the experience gave him the ability to levitate and see through walls. His religious views were a unique mix of Theosophy, which is an esoteric and occultist philosophy or religious view that combines Western and Eastern philosophy, spiritualism, and Rosicrucianism. He also believed that the Pyramids of Egypt held a special spiritual significance. Needless to say, these beliefs did not help him win over voters. 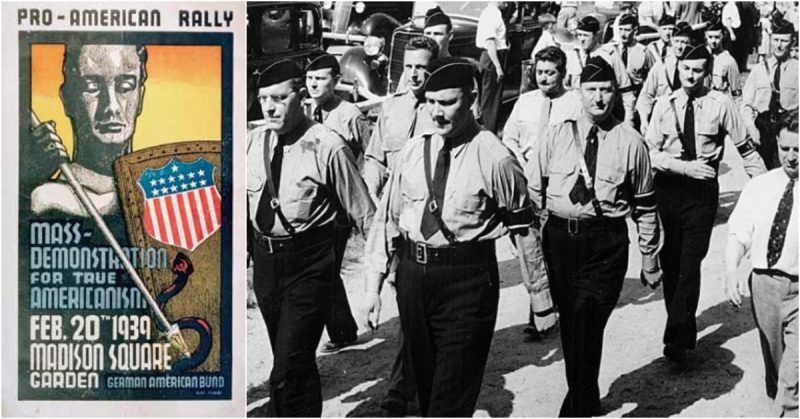 The government had its eye on American Nazis as a clearly seditious threat for a long time. Despite its later infamy during the McCarthy Era, the House Un-American Activities Committee (HUAC) did a good job keeping an eye on Pelley and gathering information about him. In 1940, the government raided his headquarters in Asheville and arrested many of his followers for sedition. 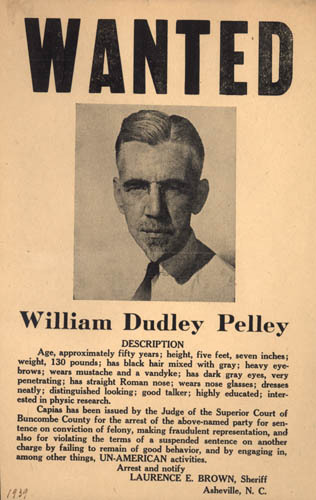 A wanted poster for Pelley. After Pearl Harbor and despite reeling from the attack, the American government wasted no time in cracking down on the Legion. On December 8th, 1941, police raided and occupied the Murphy Ranch, capturing about 50 Legion members. Pelley decided to disband the Legion, and its members scattered to avoid arrest. However, Pelley himself kept writing and attacking Roosevelt. 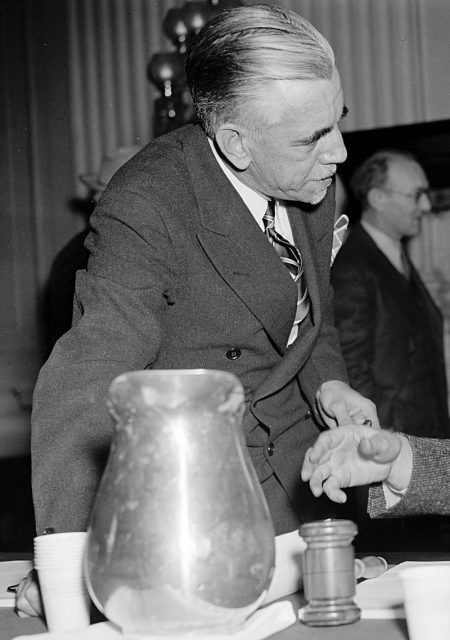 HUAC kept an eye on him, and in April 1942 he was arrested and charged with 12 counts of sedition and high treason. He was sentenced to 15 years but released after eight. As part of his parole, he had to desist from all political activity. Instead, he focused on building an unsuccessful religious movement called Soulcraft, which focused on UFOs and extraterrestrials. Upon his death, Pelley was described by the New York Times as “an agitator without a significant following.” At the time of his death, this was certainly true, but the statement may have underestimated the threat Pelley posed during his career. After all, violent extremists do not necessarily need to be numerous to be a threat. Fortunately, the Nazi movement in America was crushed before it could seriously undermine the war effort.